I'm so excited. I ordered orange, cream, and purple -fleshed, mostly the bush or semi-vining types since I don't have a large space to grow them. Even my picky pants youngest son likes sweet potatoes. I've been trying to get him interested in both gardening and also trying to widen the variety of foods he will eat, hoping that one will encourage the other. The cream/white ones are my favorites. I like them best baked, with a good amount of butter, pepper and salt. Mmm. I ordered mine from Sand Hill and I usually don't get my slips until the beginning of June. In the meantime, I have kale in that spot. That's how we like sweet potatoes best. Bake them, butter, salt a pepper. Every once in a while, we will sprinkle on a little nutmeg. My wife peels hers. I eat them skin and all. This is making me hungry for them. Carolina Ruby is a good one. I don't know when my slips are coming but it will seem like forever. I like sweet potatoes with lots of butter and cinnamon, also sweet potato bread, sweet potato pancakes, sweet potato fries... can't wait to see my kids faces when I make these with the purple ones. 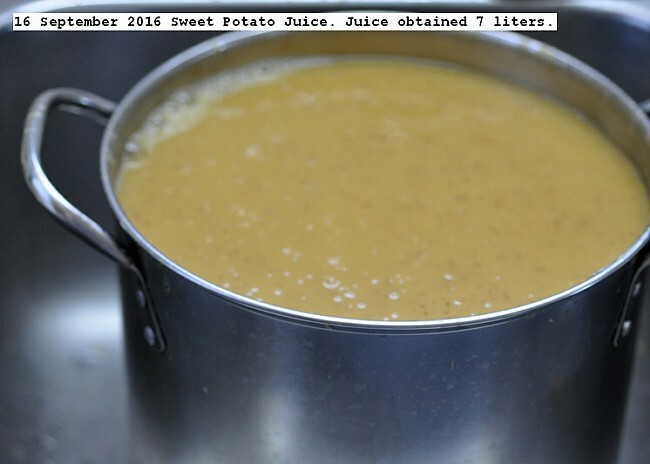 Seven pounds of the smaller sweet potatoes were made into seven liter of pressure canned juice. The slurry had very little gross material so it was only strained through the 2 mm mesh on the food mill. Seven liters of water was added to the cooking pot to make a drinkable juice. One pound of sweet potatoes to each liter of juice. The larger sweet potatoes were stored and will be used fresh. Pictures depict the juicing procedure.